In reviewing the five year time period for the above chart, ones conclusion might be that the S&P 500 index's outperformance is nearing an end as it approaches the 2014 support level. But is this really support? The below chart looks at a 15-year time frame and maybe support isn't reached until the level just prior to the financial crisis. In other words, the S&P's outperformance run may be in the early stages of a longer multi-year outperformance cycle. And finally, when looking at the time period back to 1996 in the below chart, it appears something else entirely different may drive the outperformance of one index over the other. Following the technology bubble and beginning in 2002, dividend payers and the S&P 500 Index seemed to trade in lock step as the mostly horizontal line between 2002 and 2007 shows. What seems to be a determining factor in dividend paying stock outperformance is a recession and a pullback in the broader S&P 500 Index. In the past I have written about the advantage of owning dividend paying stocks in a market pullback. 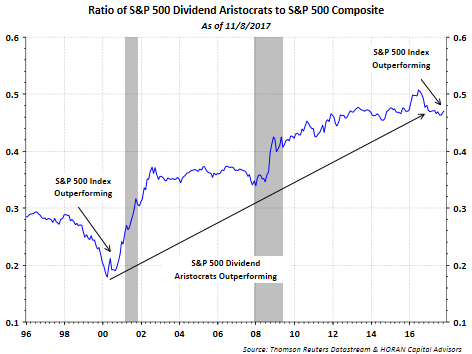 One such article titled, Comprehensive Review Of The Dividend Aristocrats, was written in 2010. In the article, detail is included on the favorable impact on overall returns and compounding if ones investments decline less in a down market. Dividend paying stocks do tend to hold up better in market pullbacks as can be seen in that prior article. In conclusion, a couple of factors that might lead the dividend payers to outperform the S&P 500 Index is a recession and/or a market pullback. 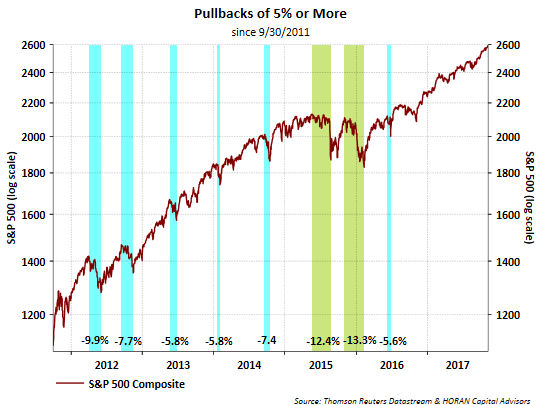 We do not foresee a recession near term; however, a pullback in the market would not be at all surprising given the last 5+% correction occurred in June of last year. It is difficult to successfully time the market and a garden variety pullback might not warrant rotating heavily into the dividend payers. 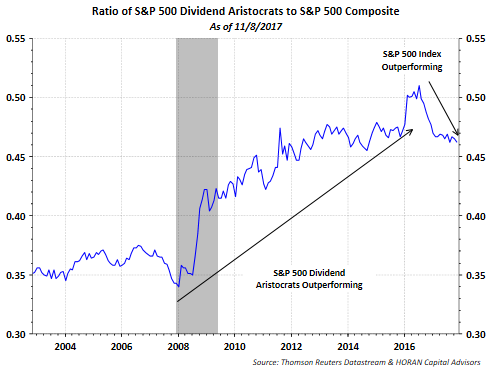 It seems a recessionary environment is most favorable for the dividend payers and that is when investors benefit the most from a higher weighting in dividend orieted equities. 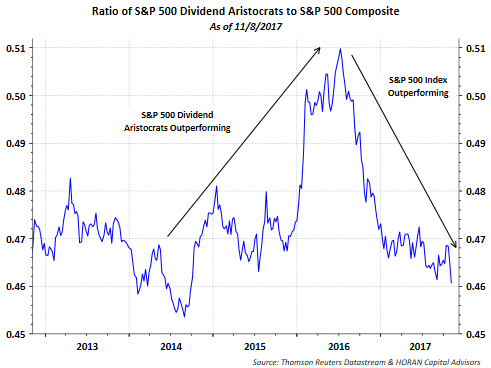 And although the first chart at the beginning of this post might indicate the S&P 500 Index outperformance is nearing an end, a recession might be necessary for the dividend payers to return to their outperforming ways.